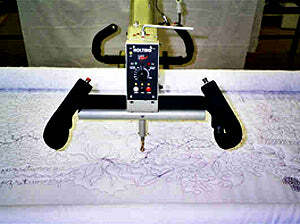 30-Inch longarm quilter has 12-inch height, bobbin winder, needles, bobbins, laser, cable chain, 4 pony clamps, and 5 patterns. 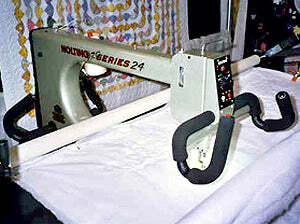 Nolting 30-Inch Longarm Quilting Machine With 12-Foot Table. 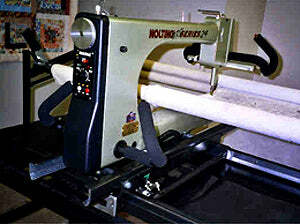 The Nolting Longarm quilting machine is the best machine for your quilting room. The originators of the modern longarm machine continue to provide you with the features you want and need at the most competitive prices. Light, strong, durable, dependable, high quality, easy to maintain, easy to repair, easy to operate, and affordable are all trademarks of Nolting Mfg., Inc.
12 foot table, bobbin winder, needles, bobbins, laser, cable chain, 4 pony clamps, 5 patterns. Nolting has maintained its sleek styling while introducing dual controls with stitch length, speed controls and needle down placement at your fingertips. With fully adjustable handles, a quilter can set the handles to a comfortable configuration that fits the style of work they want to do without interfering with visibility. Imagine the ability to set the handles close to the fabric for the most intricate detail work, and still having the single stitch and on/off switch at your fingertips! 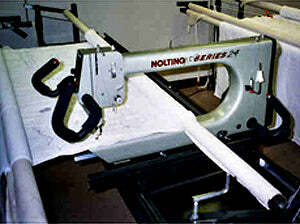 Nolting 30-Inch Longarm Key Features. 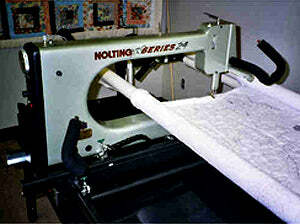 Nolting Pro Series offers the finest stitch regulation system on the market with integrated IntelliStitch technology. Its unique "Firing Stitch" gives beautiful stitch regulation from one stitch per inch to 16 stitches per inch, and all without the surging sound of other stitch regulators on the market. With the Precision Quilting mode, stitching in the ditch and outline quilting has never been easier. Although the machine offers some new features, it maintains many of the features that have always set it apart from the rest of the pack. Its lightweight design allows for long hours of quilting with minimal fatigue. Its internal motor provides quiet, trouble-free operation, while its cord chain track system eliminates any drag from the cord and with no overhead wiring to interfere with your freedom of movement. Three options available: PRO series, Equalizer stitch regulator, and Needle positioner. The new stitch regulator IS Turbo for Nolting. Front and rear control boards that are easy to see/reach. Customizable position front and rear handles for comfort and ease of movement. Nolting's all steel table includes a roller set up that provides easy access to the bobbin, and its roller lift allows easy access for smoothing batting, adding batting for trapunto, or for removing varicose threads. The wheels are fully enclosed in their tracks for solid, smooth motion. And as always, the Nolting table is "sit-down quilting" friendly, especially when used in combination with the optional hydraulic lift system. Nolting - Made In The USA! Each Nolting machine is built in their Hiawatha, Iowa factory, by the very same people who provide the technical support. Add to this Noltings solid commitment to customer service and satisfaction and you will see that Nolting Manufacturing really is the industry standard. Bodies are fabricated from 3/16-inch aluminum plate (24 inches & larger) for lightweight and super strength. This provides fluid motion for years of comfortable quilting. Sealed bearings on the drive shafts do not need lubrication for a lifetime of smooth operation. Four oil wicks to the moving parts of the head need only one drop of sewing oil every 8-10 hours of sewing. The external brush, 90 volt DC motor is mounted inside the body of the machine, keeping it away from your ears and hair while sewing. The machine plugs into standard 110 volt AC wall outlet. No special wiring needed. The gear belt drive provides quiet, accurate power to the top shaft. The hopping foot moves over seams and a variety of materials for quality stitches. The foot is also perfectly round for sewing with rulers or templates. The handles are located out of your line of sight. Their vertical placement is ergonomically correct and provides stress free operation. The focusable laser stylist is built to be located either on the front or rear of the sewing head for either linear or single cell patterns. Expanding foam is injected inside the body cavity to reduce vibration and noise for comfortable sewing. The fluorescent light is placed for excellent visibility. It can be replaced with an optional blacklight for use with day glow powder or pencils for your unique designs. The standard variable speed controller is infinitely adjustable for just the right speed of operation. All Nolting Longarm Quilting Machines can be equipped with any of the available options for a custom system to meet your specific needs. The optional Needle Positioner by Intellistitch® is available with needle up or down, variable speed control, single stitch, repeating single stitch. The optional Stitch Regulator IS2KN by Intellistitch® includes all the features of the Needle Positioner plus variable stitch lengths from 1 to 12 per inch, variable speed control with motion detector, single stitch, repeating single stitch, and precision quilting. The all steel table comes in two piece construction, making it easy to place in hard to reach rooms. All tables can be made in a variety of lengths (inquire about special lengths). The tracks enclose the wheels for solid, smooth motion. This also protects your quilts from marks if they fall on the track. The cord chain keeps the electrical cord out from under your feet while sewing on the pantograph side of the table, allowing you to concentrate on the pattern. Rollers are located so as to provide easy access to change the bobbin without moving from your location on the quilt. The roller lift holds up the quilt top roller so you can have access to the batting between the layers of the quilt. All tables come with leg levels, allowing for your custom height adjustment. Hydraulic lift legs are available as an option. The ratchet action advances the takeup roller quickly and easily. The solid wheels are fixed to axles with sealed bearing mounted on the axle for non-binding movement. A roller is included for storing large rolls of batting under the table. Easy to engage track locks help sew horizontal and vertical straight lines. All new Nolting Longarms are predrilled for attaching the popular circle, and diagonal line maker Hartley Fence. 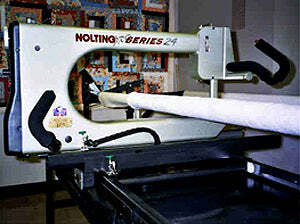 Nolting Manufacturing longarm quilting machines are built in their factory. When you call with technical questions, you are talking to the people who build the machines. Nolting offers a 5 year warranty on machines and frame. All machine packages include a separate bobbin winder, 5 patterns, 10 bobbins, 10 needles, and all manuals so that you are ready to start quilting right away.